The Dutch have been taking great delight in teasing American broadcaster Katie Couric for sharing her theory of why the Dutch are so good at speed skating – although she is not the first to suggest that the Dutch skate to work in winter. Couric’s comments have been widely shredded by the skating mad Dutch, who last got to skate on the Amsterdam canals in 2012. ‘In winter months, skating is a sensible form of transportation, as commuters skate along frozen canals to visit family or friends who live many villages away. Much of the country sits below sea level, so it’s frequently not a particularly arduous journey to travel by skates,’ the website said. It is unclear where Ilich got his information from, although on the Holland.com website Ulrike Grafberger talks about a family member visiting her grandparents by skate several decades ago. ‘As soon as we were able to walk, we children had to be put on the ice. In those days we still had wooden runners with a piece of iron underneath. It was very important for us at that time to be able to move about on the ice,’ Grafberger quotes her mother-in-law as saying. 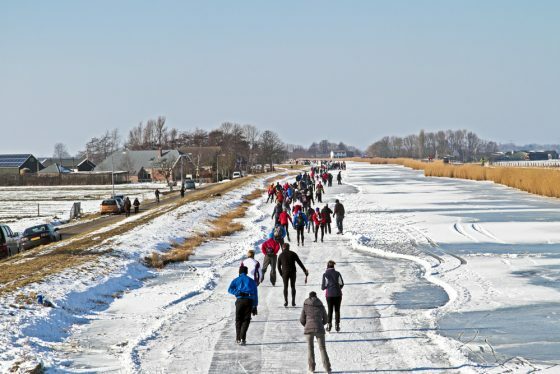 Rather than skate to work, today’s Dutch are more likely to have time off in the rare event the canals freeze over. If someone is ijsvrij – literally ice free – it does not mean they have been defrosted, but that they have been given an extra day’s holiday to enjoy some skating.